Juicing has become a big fad in our country today. There are many statistics and data on the health benefits of juicing that has led to juicing becoming as popular as it is today. This book explores juicing, discusses the health benefits, features many recipes and recommendations for healing teas, soups, smoothies and many types of juices. This book also talks about, stress, Chronic stress and adrenal fatigue. Who doesn’t have stress today? Left untreated, stress can cause chronic stress to eventual adrenal fatigue. The book talks about how stress causes us to eat comfort food, especially sweets, starches and carbohydrates. Stress triggers a drop in serotonin which causes cravings for sweets and carbohydrates. The author talks about how when we have a problem, we try to control the situation and when we can’t, we get stressed. Instead of trying to control a situation, the author suggests praying. She also talks about healthier ways to cope with stress as calling a friend, taking a walk or taking a bubble bath. The book talks about how stress can lead to binge eating and that we have three steps to facing the problem-admit, acknowledge and confront. In this book, there is a chapter that talks about how chronic stress leads to adrenal fatigue. 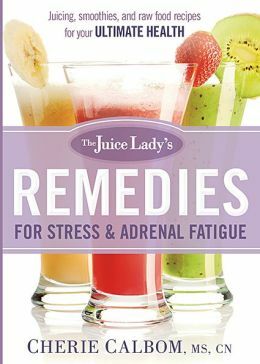 The chapter discusses the symptoms of adrenal fatigue and what you can do to restore your adrenals. Other chapters include living foods and the benefits, talks about beverages, fats, sweeteners and with choosing healthy accessories for your living foods diet and about a living foods meal plan to support your adrenal glands. This is an easy read and would appeal to people who want to overcome stress eating, poor health and would like to start juicing. There are recipes in the back of the book to get you started on juicing, making heathy soups or smoothies. About the Author: “Cherie Calom, MS, CN, is the author of 21 books, including the best sellers The Juice Lady’s Big Book of Juices and Green Smoothies and The Juice Lady’s Turbo Diet. She holds a master of science degree in whole foods nutrition from Bastyr University. Cherie and her husband offer juice health retreats throughout the year as well as health and healing conferences.” She also has a website at www.juiceladycherie.com.